There is you, there is me and there is the vast unknown beyond our knowledge and understanding. 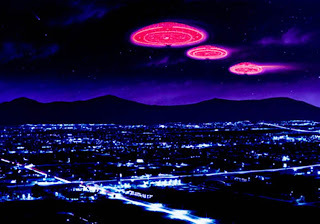 There have been multiple UFO sightings over Mexico and other parts of Southern U.S.A. There is ample evidence to prove that there is alien life out there trying to reach out and communicate with us. However, you might not see any of it in our reflecting world for reasons best known to the ones sitting on the power switch in fear of the worst. I wonder if this comes from the guilt of mass murder in the name of peace ! There have been various theories on Alien Existence and what could be there possible purpose to hover around in the skies. Humanities oldest known civilizations have the mention of gods who descended from the heavens in ancient scriptures and records. The possibility of the existence of multiple parallel universes where life forms have evolved and have somehow learnt to surpass the space and time continuum is not ruled out. The Blink On and the Blink Off theory states that there is a parallel existence however we are unable to see it because as soon our universe blinks on, theirs blinks off. They make way through a time warp to enter our universe and disappear in the blink of an eye. The movements of these objects are perfectly synchronized and they move along in geometric formations (Which looks like some alien script up in the sky) which we're yet to decipher. Ghosts, Spirits or Angels... they exist and are out there somewhere in another dimension watching and occasionally reaching out through subtle recognizable ways if you only you pay close attention ! Could there be some connection between Angels and Aliens ? Everything and everyone is connected. Everything is energy !